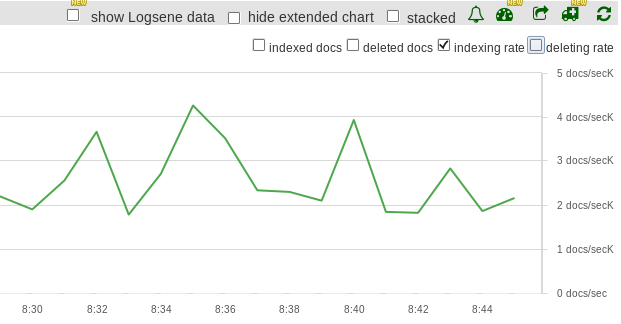 Elasticsearch is near-realtime, in the sense that when you index a document, you need to wait for the next refresh for that document to appear in a search. Refreshing is an expensive operation and that is why by default it’s made at a regular interval, instead of after each indexing operation. This interval is defined by the index.refresh_interval setting, which can go either in Elasticsearch’s configuration, or in each index’s settings. If you use both, index settings override the configuration. The default is 1s, so newly indexed documents will appear in searches after 1 second at most. Because refreshing is expensive, one way to improve indexing throughput is by increasing refresh_interval. Less refreshing means less load, and more resources can go to the indexing threads. How does all this translate into performance? Below is what our benchmarks revealed when we looked at it through the Sematext Cloud lens. For this benchmark, we indexed apache logs in bulks of 3000 each, on 2 threads. Those logs would go in one index, with 3 shards and 1 replica, hosted by 3 m1.small Amazon EC2 instances. The Elasticsearch version used was 0.90.0. 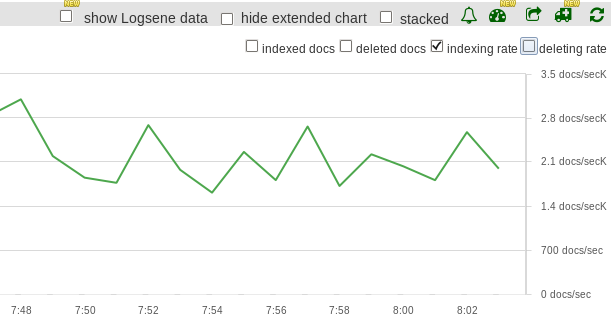 I was seeing large numbers of timeouts in my elasticsearch logs. No corresponding problems with CPU or IO. 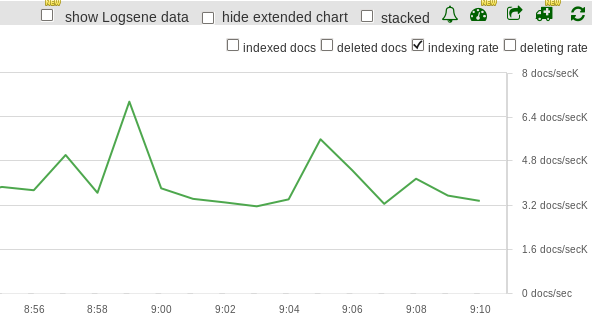 I have increased index refresh interval and decreased the number of open indexes which seems to have helped but I am concerned what is really happening. The “thoughput” that you see increase (Less refreshing means less load, and more resources can go to the indexing threads.) ought to be visible somewhere other than JUST more documents indexed per unit time, shouldn’t it? Why are you not concerned that “Other metrics from SPM, such as load, CPU, disk I/O usage, memory, JVM or Garbage Collection didn’t change significantly between runs.” — I would expect to see something improve? Does it make sense to look at network latency? JVM thread dump? Hi Chet, thanks for your comment – you make really interesting points! We actually do see other metrics change, beyond throughput: refresh time drops. Basically meaning less CPU spent in refreshes, less caches being invalidated. Here’s where the test isn’t realistic (well, most tests aren’t, they’re just guidelines to see if there’s a difference or not) because we didn’t run realistic queries at the same time – we’d probably see some changes in cache churn, for example. I don’t think network latency would differ significantly (only maybe because you can process more data, so more data will be sent under load) nor the thread dump (except for having more refresh threads maybe?). Either way, my point about other metrics like CPU and IO staying the same is that there’s no other trade-off to make for increasing the refresh interval, except for user experience: indexing will be lighter and/or faster, and queries should be a bit better, too. It’s not like you use more CPU, disk and memory. Hi I observed a situation but I don’t know is this normal or not. I use Elasticsearch 1.7.2 and my observation as below. I set a index with refresh 6s and when I start to add a document to this index, every 6s I see filesystem change, that is a *.cfe,*cfs file were created. If I keep adding document to index, every 6s file were created. Is refresh will trigger flush action if there is a change occurred? That measn if there is any pending doccument in buffer(or translog change), refresh will flush to disk and generate a small segment file? It is somewhat normal in the sense that refreshes writes new segments with whatever is in the indexing buffer at the moment, but those segments aren’t fsync()-ed to disk. Only a flush does that. I noticed that when I add document to index, first I see two files created but 0KB until refresh_interval(6s), the files will be 2KB (depends on how many documents added before). If “that refreshes writes new segments with whatever is in the indexing buffer at the moment”, what is the purpose to set index buffer? I thought that refresh will not flush segments if buffer is not full? By the way, I forgot to mention that me ES is on Windows machine. It is fsync() still applied ? Oh, I don’t know what the directory implementation is on Windows (I suppose you’re running the default hybrid niofs+mmapfs?) but this might explain the behavior you’re seeing. As far as I understand, a refresh implies a Lucene flush (https://lucene.apache.org/core/5_0_0/core/org/apache/lucene/index/IndexWriter.html#flush%28boolean,%20boolean%29) while a flush is an actual commit (https://lucene.apache.org/core/5_0_0/core/org/apache/lucene/index/IndexWriter.html#commit%28%29). Only the latter guarantees that files are persisted to disk, while a refresh may or may not write something – depending on the Directory implementation and the operating system. I hope this helps shed a bit of light. RADU, thanks for you kindly reply. Does elasticsearch provides any API that can easily check on which fsImpl. being used currently? I wonder, if choose mmapfs is better then hybrid one? Do you have any experience of this comparison? Thank you the good article. One quick question: When it says “refresh_interval” of 1 sec. – what does it mean? Does it mean after *every* 1 second keep refreshing the index (no matter if there are changes or not) – or does it mean once there is a change to the index then (and only then) after 1 second do the refresh? What I am trying to understand is: does the refresh( ) method keep getting called always or only as a trigger to some data changes? Hi, and sorry for the delayed reply. Refreshing is always called at the set interval – you will see load on your machines even if data wasn’t added in that time. But when that happens, the load shouldn’t be high enough to be worried about it anyway. It becomes problematic when refreshing slows down indexing (and invalidates caches, but that isn’t covered in this post). Cool – thanks for the info. Yes, the difference in indexing throughput is there because if you up the refresh_interval, you basically lower the time ES spends on refresh operations – freeing up CPU for other operations (such as bulk indexing). As the refresh_interval increases, the refresh time takes a less significant part of the overall computation, so increasing it further may not matter (depends on how your data and hardware looks like). Increasing the buffer and translog sizes will make ES flush less often and, again depending on your hardware, might decrease the overall time ES spends flushing. Whether you use SPM or not, monitoring can tell you what the bottleneck is for your use-case (it really depends here, though I hate to use this expression). For example, if you see tons of CPU I/O wait, you’ll know it’s disk I/O. Usually the bottleneck for indexing performance is usually CPU, assuming the disks can handle the sustained writes, and in most cases they can, even with spinning disks. Great post. I wonder why we don’t see as much improvement when changing refresh_interval from 5s to 30s as much as we do when changing refresh_interval from 1s to 5s. Is it that 30% of index buffer is not enough? Or is it disk IO? Did you guys care to check? Right, that should help (also check my reply below). Here I was assuming some sort of near-real-time search is needed. If you do batch indexing (for example, update stocks every night in a store or similar use-cases), then it makes sense to disable automatic refreshes altogether (set refresh_interval to -1) and enable it back after you’re done. Thanks for sharing the information. What was your average document size in your tests? We are running our test with 144 KB document size with SSD and good Hardware, but aren’t getting anything above 200 documents per second. We are keeping refresh interval as 1second, since we want the data to be read as soon as it is written. Any ideas to improve performance are most welcome. I don’t remember exactly, but I think there were some Apache logs of about 240 bytes each. This is definitely the main cause for your smaller numbers, you have much bigger documents. TD: which part specifically? When your documents are huge then you can’t overdo indices.memory.index_buffer_size, yes, as I think it’s implied here. Were you referring to something else? When the indexed documents are large, this seemed like not a good idea. The suggestion to increase refresh_interval to 30s blew up my system. So be aware.